Levitating Balls – Sports Balls, of course! Here’s a new levitating deco gadget. Instead of the usual Earth globes or other planets, this one’s more mundane. Actually, it’s quite a nice present for any sports buff. Whether it’s that snobby boss of yours, or your kid you’re pitching to on Saturday morning, you’ll find one for any of them. 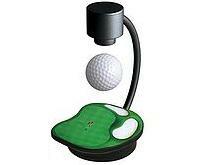 There’s a golf ball floating above a mini pitch, and a baseball that levitates above a base. Click on for some bigger pictures and for the little extra info you need to know about these. Read moreLevitating Balls – Sports Balls, of course! Digital picture frames have really taken off this year. Here we compare some of the cheapest and best digital picture frames that are currently available with regards to both features and value for money. We’ll also provide an explanation of all the features that the various digital photo frames have to offer. Check here for a full selection of digital picture frames for sale or continue down to read our reviews and comparisons. You can see an explanation of all comparison points here.